Rhyzopertha is a monotypic genus of beetles in the family Bostrichidae, the false powder post beetles. The sole species, Rhyzopertha dominica, is known commonly as the lesser grain borer, American wheat weevil, Australian wheat weevil, and stored grain borer. It is a beetle found nearly worldwide as a pest of stored cereal grains. It is also a major pest of peanuts. The female lesser grain borer lays between 300- 500 eggs over a period of three weeks. They are laid singly or in clusters from 2-30 and are often attached to the grain. 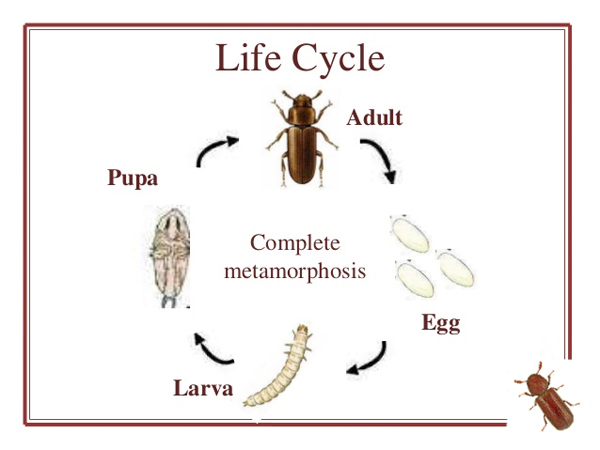 Depending upon temperature the eggs hatch in 7-18 days to give white larvae with brown heads and relatively small legs. Lesser grain borers mainly attack wheat, corn, rice and millet. Both the larvae and adults are primary pests. ... Larval and adult feeding in and on grain kernels may leave only dust and thin brown shells. A sweet, musty odor is often associated with infestations of this insect. Prevention is always the most economical and efficient method of controlling these pests. Once they are distributed within the grain mass, fumigation is the only method of relieving the problem.